Just last night, I attended an SCA event with my (now 7 year old) daughter. She was dressed in a really nice patterned velvet green Italian renn dress . 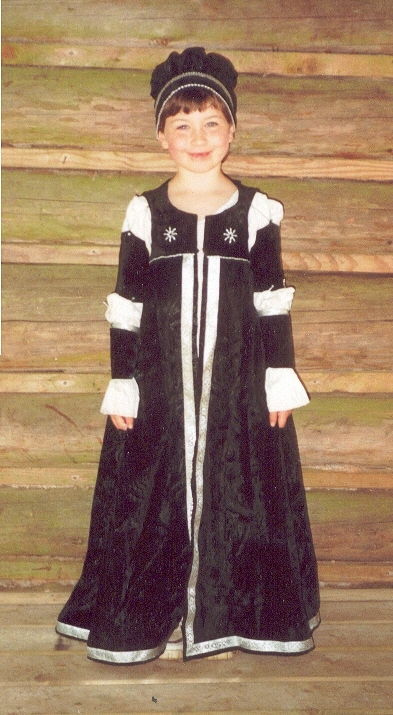 It was and still is, quite pretty to look at, the sleeves were adorable! Well, the dress had been designed for her when she was 4 years old! As I dressed her that night, the bodice barely fit around her chest. I decided it was time for Cassy to have a new gown. She couldn't wear that again! So, I started thinking what I could make her. I wanted something she could wear and sit in, as well as attend court in. I finally decided I was going to make an Elizabethan outfit for her.... pants to wear on warm and run around days, and a skirt to wear to court. The sleeves would come off and on, and all parts would be interchangeable (wow. Ambitious, no?). Here is the dress as constructed by pieces. It was a challenge, and it was alot of work, and she ended up outgrowing it before it was all done. :( But, it's very pretty! If you don't want to jump to the next section, you can follow the MOVING ON! link.